DAMAGING DAMAGES. What started as a $289 million fine just had an even bigger financial effect on pharmaceutical and life sciences company Bayer. It’s now down $14 billion. On Friday, a state court in San Francisco, California, ruled that Monsanto — an agritech company Bayer acquired in June — owed California school groundskeeper Dewayne Johnson $289 million in damages. The reason: the company’s weedkillers Roundup and Ranger Pro gave him terminal cancer and weren’t adequately labeled to detail those risks. Monsanto announced plans to appeal the court’s decision, but that couldn’t stop Bayer’s shares from plunging 12 percent on Monday, the equivalent of roughly $14 billion in value. 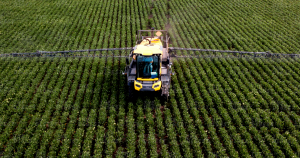 However, in December 2017, a U.S. Environmental Protection Agency (EPA) analysis of numerous studies led to the conclusion that glyphosate is not likely to be carcinogenic to humans — the data suggested the relationship wasn’t there (of course, the $120 million Monsanto and Bayer spent on U.S. government lobbying in the decade prior to that decision could have had some influence on it). BAD FOR THE BOTTOM LINE. Carcinogenic or not, Monsanto’s glyphosate-containing products are still widely available, and that might not be in Bayer’s best interest if it loses its appeal of the California case. Johnson’s lawsuit is one of about 5,000 like it, and they could just keep coming as long as Monsanto’s glyphosate products are on the market. If each of those existing lawsuits returns the same verdict as Johnson’s, Bayer could owe a whopping $1.45 trillion in damages — more than enough to bankrupt a company with a market cap around $104 billion. But if just a single ruling in favor of the plaintiff was enough to cut Bayer’s value by 12 percent, Bayer may not need 5,000 verdicts to see some pretty substantial damage. Similar effects in the stock market from any future verdicts might mean that Bayer seriously regrets acquiring Monsanto — assuming it survives the aftermath.